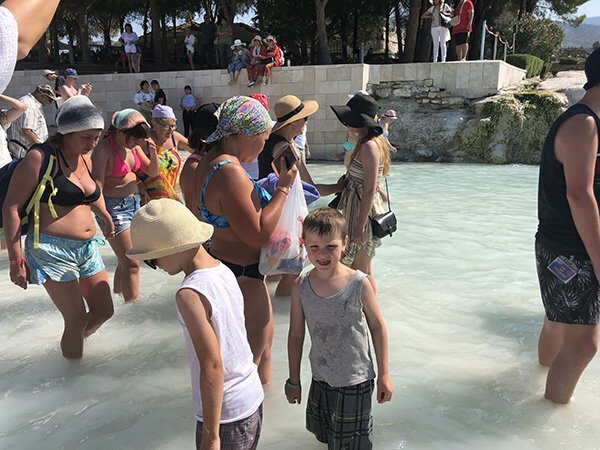 Are you looking for information on visiting Pamukkale or tips for visiting Turkey’s thermal pools? Then you have come to the right place! Pamukkale is probably a landscape you have only seen in one of those video’s about places on Earth that are “out of this world!” Its snow white cliffs and jewel blue waters look more like a frozen landscape, than a calcite-laden cliff formed over thousands of years. 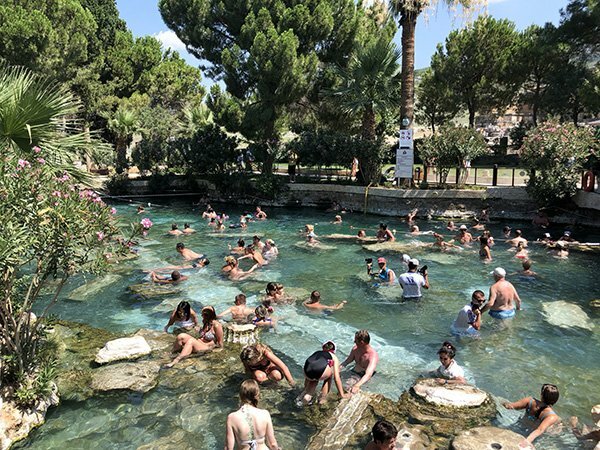 Natural hot springs in the are are responsible for the “Cotton Castle” and it is Turkey’s most popular tourist attraction, as far as ticket sales go. 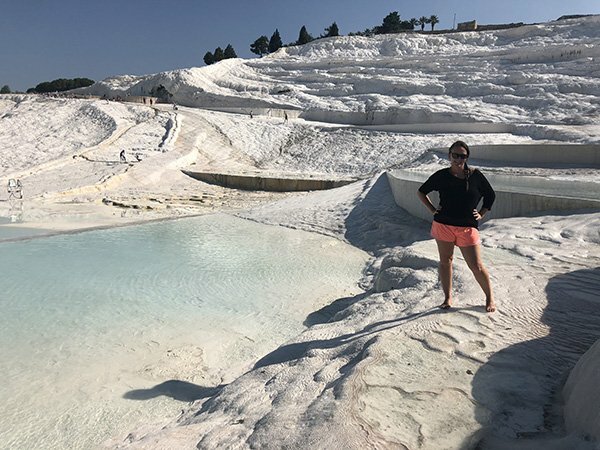 I have put together a guide to visiting Pamukkale and things to do in Pamukkale to ensure you have a great visit! 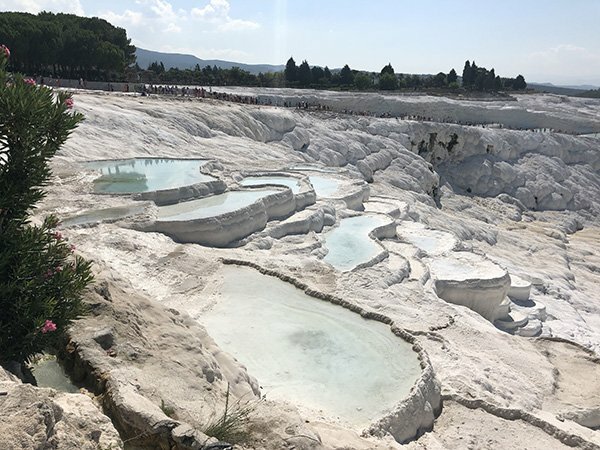 This amazing phenomenon of limestone terraces, similar to how stalagmites and stalactites are created, was almost destroyed in the 1960s when hotels sprung up in the area to take advantage of the Pamukkale thermal pools. It was only in the 1980’s when UNESCO stepped in, were the buildings removed and the site deemed UNESCO protected and the repairs to the damage began. Today, there are pools in the limestone for visitors to wade or bathe in, as well as an ancient pool. You do not walk or can you get near most of the terraces, unless you fly over them by paragliding or a hot air balloon, both are popular attractions in the area. 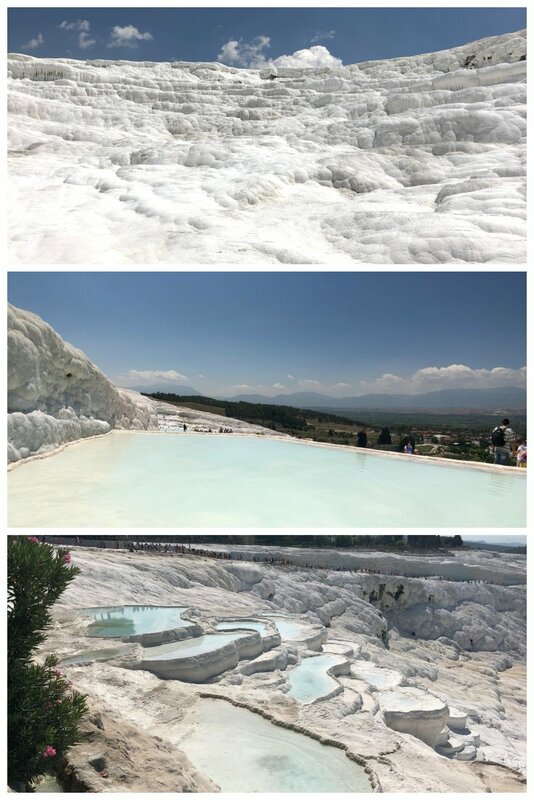 So despite not snapping the same guide-book style photo, you can still see beautiful terraces with powder blue waters and enjoy the hot springs barefoot. You might vision yourself wading into pools with this natural all around you, but in reality, some of the pools are more like this! But a wander just a few minutes along the terraces and you have more room to enjoy! As Turkey’s largest attraction as far as ticket sales go, over 5000 visitors can arrive on the site per day. It is part of the typical Turkey Triangle tours, where visitors also experience Ephesus and Cappadocia. Other visitors are day trippers from the coast. If you are wanting to visit on a day trip, here are a few options. If you have the time, spend the night before in Denizli or Pamukkale itself, and visit early in the morning. you will beat the day-trip tours to the site and can wander without heavy crowds. Outside of the site, at the lower gate, you can buy a big bottle of water for 1 TL. Inside the site, expect to pay 10 times that! A can of pop in the cafe at the ancient pool was 13 TL when I was there (about USD3). You can get it for about 2 or 3 TL outside the site. You have to walk the white calcite in bare feet so slip on shoes are ideal. You can either leave them at the bottom or the top, or carry them with you. If you are at the bottom, I don’t suggest you leave them there as the rest of the site is gravel and dirt, you will want shoes at the top. If you are at the top and walking to the bottom and then back up, you can leave your shoes at the top if you want. The Ancient Pool, given to Cleopatra from Mark Anthony. It is now full of the columns that once stood around the pool, thanks to an earthquake. The pool is full of bikini clad bathers, do not feel shy and bring yours too! 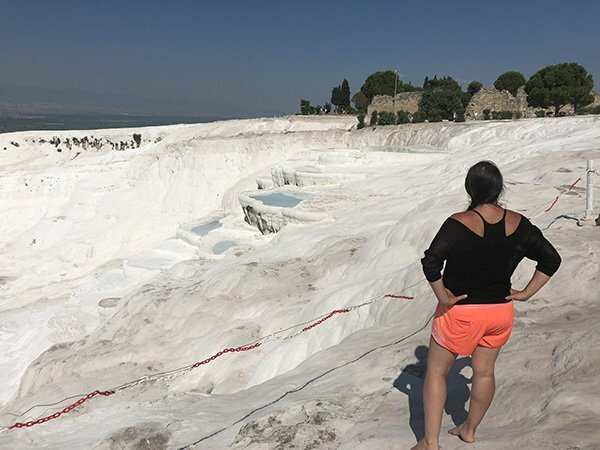 Can you wear a bikini in Pamukkale? Wear your swimsuit under your clothes so you can easily slip them off if you want to swim or enjoy the pools. The Ancient Theatre at Hieropolis. It takes less than an hour to explore the site, do not skip it whenyou are visiting Pamukkale. 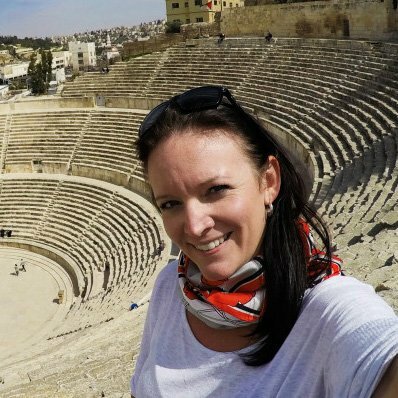 This ancient city has a beautiful amphitheatre that is worth visiting. 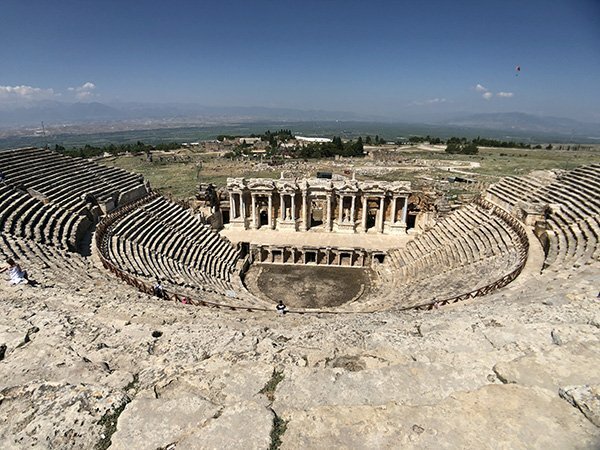 A few hundred meters uphill from the travertine pools of pamukkale hot springs you will find a well restored theatre and plenty of other Roman and Greco Architecture. Is it too hot in the Summer to visit Pamukkale? We visited mid-July, and although hot, having your feet wet made it much cooler than expected. But by noon, the sun was very hot! Bring lots of water with you as you do not feel very thirsty in the water. 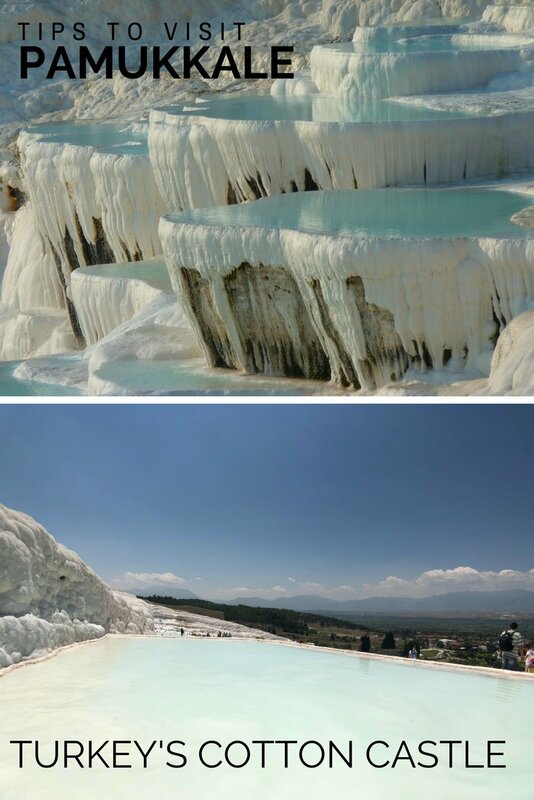 How long does it take to visit Pamukkale thermal pools? Well that mostly depends on what type of traveller you are. We spent three hours at the site, arriving from the lower gate, walking to the ancient pool and then up to the Amphitheatre. We then walked back down, taking photos and enjoying the pools. If you wanted to explore more of the Hieropolis you should plan for half a day, but if you are a wander around, take a few photos and leave, you could do the pools area in an hour. Add in some of the Hieropolis and add another hour as it is some uphill walking. If you wanted to swim in the ancient pool (which looked cool with the sunken columns beneath the water) you could add an hour or so to your visit. If you want to explore all 16 points of interest on the site, you would need most of a full day. The pool was thought to be a gift to Cleopatra from Mark Anthony and in the 7th century an earthquake sent the columns into the pool where they lay today! 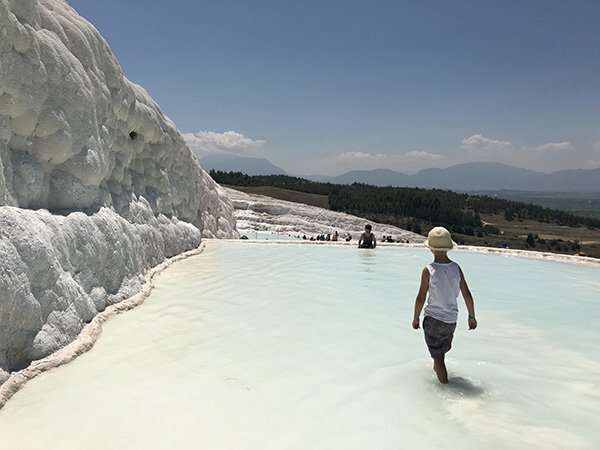 How much does it cost to visit Pamukkale? I wish I could fly my drone over those terraces for some great photos, but drones are not permitted in UNESCO sites. But you can get a great bird’s eye view by taking a balloon tour or paragliding ride over the terraces! In Turkish, bus is otobus and there is an intricate network of busses that run around the country. We took a bus from Bodrum to Pamukkale. You can also go by car, or train. 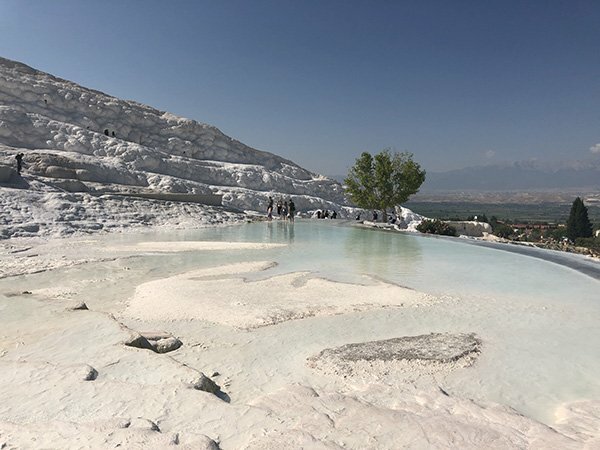 If you have spent the night in Denizli, take the local mini-bus to pamukkale and get off in town, which will be a few hundred meters from the lower gate of Pamukkale. The big crowds will arrive from the top, as that is where the tour busses drop off passengers as there is room for parking there. If you are arriving into Bodrum port and want to go to Pamukkale, the bus station is close by. You can walk there in about 5 minutes. We were staying in Bodrum and took a minibus to the terminal. We lucked out and walked right into the terminal and bought a ticket and hopped on the bus and it left! How long does it take to go from Bodrum to Pamukkale? The bus from Bodrum to Pamukkale takes about 4.5 hours and stops about 5 times for toilet or cigarette breaks. The bus does not take you into Pamukkale. It stops in nearby Denizli. Then you can take a minibus for 4 TL per person and it takes about 15 minutes to get into Pamukkale. This is what we chose to do, as we were arriving in the afternoon and wanted to see the site the next morning. We stayed in this hotel (a triple room), for around USD 40 and after we dropped our luggage we wandered up to the site and had something to eat. You can get from Izmir to Pamukkale by train in about 4 hours. There is a train from Basmane station to Goncali (north of Denzali) and then you are about 10 minutes by taxi to Pamukkale. You can also take the train to Denzali and take a mini-bus from the station to Pamukkale. When we took the train, we did it from Denizli to Izmir and paid 23 TL per adult (less than USD6) and kids were free. There are about 4 trains per day. If you are leaving Pamukkale, take the mini bus for 4TL per person to the main Denizli bus station. It is less than 5 minutes to the train station. You have to go right through the bus station and out the other side, walk about one block and cross a busy street. It is not too hard to find, but there is no signage. We asked someone at the bus station and they pointed us in the right direction. Once close you can see the train logo. The platform is down below the road so it is a bit hard to see. If you do not have time to stay overnight, consider this Pamukkale tour from Izmir. It will pick you up from your hotel and take you to Pamukkale and bring you back to your hotel at the end of the day. Turkey is a big country, and visiting Pamukkale from Istanbul is a full day, if not a two day excursion. You can fly, drive or take a bus or train. There are also lots of tour operators who will take the pain out of trying to figure out the best way to go. If you are looking for this option, fire me a message or email and I will see if I can help you out with some options! this is a must, the bright sun beating off the white pools and white calcium is blinding! If you don’t happen to have some, you can buy them from any vendor down the stret. Bring your camera and act like an instagram star! They will be all around you, so enjoy taking some photos while you wade into the mineral pools. Although Turkey is a Muslim country, it is much more modest than other muslim countries that I have visited and walking around the site in a bikini it quite normal. There will be hundreds of other tourists doing it. Although I thought it was quite odd to see many of them climbing up to the theatre in nothing more than a bikini and flip flops, so I suggest a modest bathing suit cover up at least. Your drone, you are not allowed to fly it in this UNESCO site, although there are no signage. If you want some great views of the site, you can take a hot air balloon ride over the terraces and watch the sun rise! I would have loved to do this, but my kids are a bit too little to enjoy it! You can get more details here. 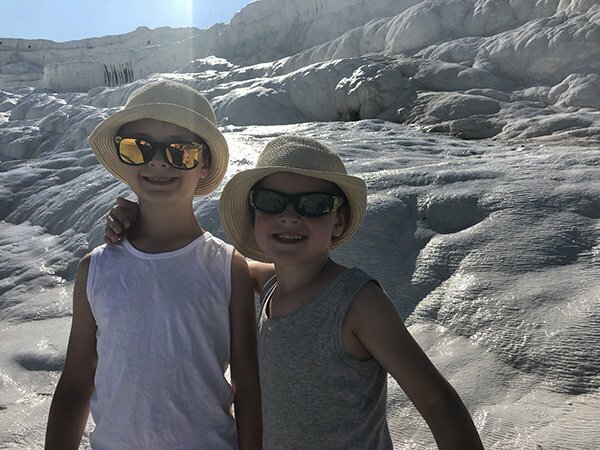 Do you have any questions on visiting Pamukkale? Let me know and I will do what I can to help! Pamukkale is indeed the stuff that dreams are made of. The blue waters seamlessly merge with the white shores to create a mesmerizing effect. Your pictures are stunning and have lovingly captured the beauty of the place. Apart from the natural charm of the place what fascinates is the history of the region and the fact that the place was a Spa city even in ancient times. Pamukkale is a natural wonder that would be so cool if somehow kept in its natural state. Alas, it has been changed dramatically. I too, found that sunset was a special time. The view to the west across the valley is very dramatic and most of the people were gone when we visited. The ruins above the travertine are quite cool. All in all, this has the potential to be a really special place, but alas it doesn’t quite live up to the hype I’m afraid. All I hear is great things about Turkey, the crossroads from Europe to Asia, kind of located in the center of the world, gotta get there one of these days.